← Home Projects to Try! Every year we would get Easter Baskets from the Easter Bunny (just like stockings from Santa). My mom would fill our baskets with special treats and toys along with hiding Easter Eggs. It was almost like waking up on Christmas morning! 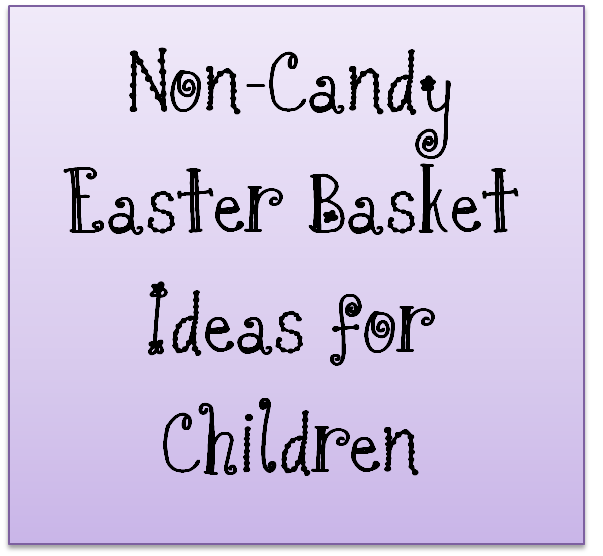 This year I only have my toddler-age Godchild to make a basket for, but I have been thinking about lots of other ideas! The following is a list of Easter Basket Filler Ideas that don’t involve candy – some to make and some to buy. Just follow the links for the craft tutorials or instructions! Instead of using Easter grass, use fabric, a new piece of clothing, a baby blanket, etc. Art supplies – paints, crayons, color books, notebooks, etc. Sports/outdoor equipment – Frisbee, balls, 2 person paddle games, etc. Beach or toy box– Sand pails, shovels, measuring cups, sifters, funnels, etc, This book would be cool too. Dress up – Jewelry, shoes, clothing, etc. What are you putting in your Easter Baskets? We’re putting an empty puzzle box in the basket this year, with the pieces in the plastic eggs. Kiddo has to hunt for all the eggs to get the pieces to complete the puzzle! We’ll still do some candy in a few eggs, but nearly as much otherwise. totally like this idea…since I only have my niece to do things for and her parents asked me not to buy her to much candy…this would be perfect…thak you!!! I have found cute little eggs that have flower seeds in them at Lowes. the kids open the eggs and water and it grows a flower that you can transplant to a bigger pot. Lowes also has some really cute gardening items for kids and plant kits that kids can grow. My kids love being outside.. so I thought this would be something we could do together. I got some cute baskets at the dollar tree and I am going to put their names on them and pretty it up. So far I have put in flashlights,socks,spiderman soap(for older childand Elmo baby wash for the baby.I also have cute little prayer book that have easy to understand prayers in them.I want to add a little more of Jesus in the basket since,after all,that is what the holiday represents.I love your ideas!! Sounds awesome! My mom would always shop at the dollar store for us. The bible book store or other religious shops have some cute little things to add too – personalized bookmarks with names and versus, stickers, etc. Good luck and thanks for stopping by! I’ve put in little bags of Teddy Grahams, Goldfish, Smartfoods, granola bars or other non-candy treats. Small change inside plastic eggs is always a hit. Matchbox cars or little action figures. Baseball cards (or Pokemon etc) as they get older. Paddle balls, punching balls, jump ropes, etc. My mom always put a colorful pinwheel in the basket, so it came out throught the opening at the top – it looks pretty. My kids like the little toys and snacks they get, I put in just a couple small candy items and they’re just fine with that. One year I did a cool container for their room to store small stuff in as the basket, and put in a new beach towel as the “grass”. The next year I used a new bicycle helmet as the basket! We always got a new swimsuit, goggles and a pool toy for the upcoming swim season! I love the new swimsuit idea! I just may have to do this! Hmmmm you got me thinking now! We are going to get waterproof disposable cameras for our kids this year! Could go along with the swimsuit/goggles theme! I am the proud Mam-ma of toddlers & I always fill their baskets with new spring & summer clothing , and a few small toys. My 3 year old granddaughter loves her nails & lips to match her outfits, so I will including nail polish & lip gross of all colors. The new clothing items helps with their parents budget. Last year I found back packs for 80% off & filled them with outfits, matching socks & underwear & sidewalk caulk they still use the back packs. $5 Gift cards to their favorite treat places that they can use when out with friends – Slurpees, Sno-Cones, Ice Cream Cones, Chick-a-Fil, etc. Those are definitely favorites for us too! Every year the kiddos get a new swim suit in their buckets since we always take a beach trip in May. I also include some of the toys simiilar to the beach theme basket above. An itunes card for movie, tunes and book downloads for the trip have been going in for the ride. The only candy that goes in is a chocolate bunny (my kids don’t eat candy and it’s too big of a temptation for me). I always put a bathing suit, goggles, beach towel, water toys and flip flops in our baskets. I have to buy all that anyway..might as well kill two birds with one stone. Love your list of ideas for every liking! I’m always looking for fun things for my kids and their friends that promote health, learning and an active lifestyle. I will use your ideas for birthdays, halloween, easter, etc….Thanks!! Just went shopping for my almost 18 month old’s first easter basket (didn’t do one last year since she was only 6 months old). I got her a new little outfit, 2 pairs of socks, a 6 pack of hair clips, a new book, a stuffed monkey, an egg shaped sippy cup, a rug for the bathroom or her room, glow-in-the-dark bracelets (to do in the bath tub to make it fun one night), cadberry creme eggs, some sour gummy candy to stuff in eggs, peeps, and an egg with M&M’s. Love Ur ideas! I have a grand son and grand daughter. I bought bible stories for boys and a bible story for girls book for each of their baskets. Got them at Walmart. The boys book tells about boys in the bible and the girls book tells about girls in the bible. So sweet! Here’s another, instead of baskets… rubber boots! They come such cute designs and colors, and it is that time of year. Love the idea of using rainboots! I use sand buckets for easter baskets and put pool toys and goggles in it. My mom does that for my nephew, he absolutely loved it! This is a good idea too! We do garage sales all the time, and the kids love buying little things and spending their own money. So, if they found money in thier eggs…. they could use it and get awsome things at garage sales! The hunt for awsome things at grage sales always makes it fun… now the hunt for eggs with money and then the yard sales oh my goodness…. sounds like fun. I can’t wait till Easter! I love that my family isnt the only one that made the day about candy! There were 3 of us and my mom would do a color matching treasure hunt for us easter morning before church. Our personalized maps and baskets would be on the bed in the morning when we woke up and always end with out easter outfits. It was a fun way to start the day and there was never a ton of candy. Goldfish, a few jellybeans, coins, and stickers were in the eggs and then there were some eggs on top of our easter gifts like diarys, kites, new piggy banks, and funny socks. My mom is still a funny sock addict! My son is 5 and this is the first year I’m going to try and continue the tradition. FINGERS CROSSED! Great Site! Thank you so much! I make my kids a fun coin bank with their names on them and then hide lots of coins in the eggs. I add fruit snacks and dehydrated fruited (my kids love dried apricots) in place of candy. They each get a DVD and few little things like a coloring book, stickers, etc. Cute ideas. They are getting so much candy from the Grandparents I wanted to do more of these type of things. We are also putting in some wild flowers seeds and bean seeds. He’s begging for roller skates too, so maybe those if I can find something good. But that ups the price with a helmet to buy too. At our house, the Easter Bunny fills plastic eggs with coupons for the kids to redeem throughout the year, such as “choose what’s for dinner”, “have a friend over for dinner”, “pick a park for the family to go to”, etc. At our house, Santa always puts socks and underwear (among other fun items) in the stockings and the Easter Bunny brings this year’s swim suit and summer shoes. I make HUGE baskets but always have useful yet personal items for each of my 3 kids. My teenage son just bought a car, so my husband bought him an oil pan as an Easter Basket, and put in the supplies to change his own oil. We also got him a gas card. Love hearing everyone’s traditions! What great ideas! I’m thinking about making a costume of my godchild’s saint for her basket. Since she (the saint) usually carried a basket filled with food to give the poor, I thought it would be neat to fill a basket with play food and a simple hooded cape so my godchild can dress up as her saint. It would also be cool to make dress-ups for Bible story characters…wouldn’t it be fun to dress up as Queen Esther or Joshua? I am thinking of making a costume of my godchild’s patron saint for her basket. St. Brigid always gave away food, so I can fill a basket with toy food and make a green hooded cape for my sweet little one to wear. Wouldn’t it be fun to have baskets with different Bible characters? Queen Esther, Ruth, Samson, Joshua…. My parents used a ball of yarn each in different colors and wrapped them around chair legs etc. throughout the entire house. It was always fun to follow and rewrap your yarn into a ball. At the end was your Easter basket. This was particularly great when we lived in an apt in NY and in Europe. Also good when it rains. I’ve done all these for my 2 girls. As they got older we would have a scavenger hunt for a series of plastic eggs with clues in it for the next one and the end would be their baskets hidden in places like the dryer, closet or oven !But my youngest graduated last year and I feel those times are over now and I will terribly miss them. Since when is sidewalk chalk toxic? Great ideas! So glad there are others out there pushing a more healthy and still fun option! So many Holidays/parties and they all have such a big sugar push! I know that candy is easy and cheap…but some times its just too much! Thanks for sharing! Awesome ideas. I cringe when I think about how many candy “opportunities” there are each year. I’ve been filling my kids’ baskets with more non-food items each year. Actually, I loved your ideas so much I linked them to my Easter prep post today. I hope you don’t mind. Check it out. I always put in a new toothbrush and paste. I do this for most holidays, then I don’t have to remember to replace them every 6 months. I shared ths with my mom when she asked “if no candy – what CAN I put in it? !” thatnks for a sweet list to refer to! Thanks for the post. I found you thru Pinterest and repined it myself. Have a great Easter! My mom (aka Easter Bunny) always gave us a jump rope! Felt is a great material to use to decorate. And if the basket is wrapped in felt you can swap and change the design everyday with ease! I have 4 kids ages that will be 11, 7, 5 & 2 for next Easter. I do very little candy!!!! They get a small toy they’d like, kite, coloring or sketch book, cheap movie, sunglasses, sand toys, flash light, chap stick/ lip gloss, sports bottle BOOKS (2) book mark, crayons or markers and stickers. I don’t do Easter grass either and I usually put everything in a small laundry basket or a plastic beach tote that they can use for something else. I fill eggs with erasers, rubber band bracelets, small toys, silly putty eggs, chalk eggs, play jewelry, pairs of earrings, small cars, mini skate boards, more stickers, $, key chains (for on back packs), and some candy. I color code everything for them egg hunt is no exception and it keeps them from fighting, older kids eggs are more difficult to find while the baby’s are just scattered in the grass. That way I can make sure the stuff each kid likes is in their eggs, the get $1 in change and a $2 bill each for their banks. They each get a small chocolate bunny, a handful of mini tootsie rolls, and a sample bag of jelly belly beans. They get so much candy from everyone else and have other egg hunts to go to so I keep it at a minimum. Hobby Lobby has great themed Easter baskets, ie Spider-Man , Princess etc. Dollar General has sports themed eggs , animal print etc. Such great ideas. This year I am filling the baskets with family fun ideas. A family season pass to the zoo (each kid will receive thier favorite zoo animal homemade pass or zoo bucks for the trip),a season pass to botanical gardens, a movie pass for cheap theater (ours has a $6 pass good for movie, small popcorn and small drink), I will fill eggs with chuck e cheese or zoo tokens, and maybe I’ll throw in some gift cards for thier electronic devices. Some great ideas here. I love the thought of incorporating things we need to get anyway. This year we will likely be hunting for pokemon cards, markers, and school snacks. I also found some cute kid umbrellas…my kids love them rain or shine! Love all the ideas! I want to put PJ’s, bath toys, bath towel, coloring books, Flip Flops, Rain Boots and goggles in my sons basket this year. My son is fixin to be four and he loves bath time and mud so I thought I would combine them! What wonderful ideas! Hope I contributed something back! Happy Easter! My son loves mud and his rainboots too! Last year I did a “Summer of Fun” Easter basket for each of my grandchildren. They included a summer pass to the local water park, flip flops, bath suit, beach towel and sunscreen. They loved them and so did their parents! That sounds like a lot of fun! And it seems like sunscreen, flip flops, and towels always come in handy! Maybe next year, for my son I will do a “Zoo basket” with passes to the zoo, and other animal themed books/games/toys. is there a way i can pin this list on pinterest? button, you just hit that button then select the graphic shown on the blog post, or you can click the “pin it” button on top of the blog post.